It’s been a few crazy weeks around here. There’s been loads of school holidays, family visits, and taking advantage of the unseasonably warm weather. Plus, throw in Halloween, and we’ve been just swamped! So, after regrouping and tackling a bunch of house stuff that I’ve been putting off Iast week, I’m back with another tutorial, this time on the husking technique! Husking paper is definitely outside of the normal realm of quilling, but it doesn’t have to be scary at all! It’s simply a matter of wrapping strips of paper around pins over and over to create a design. The only tools you will need are the paper you choose, (I choose red), glue, a template on cork board under wax paper, and some pins. Today, I’m including the simple flower petals I used as a printable template, but you can always draw your own, too. One of the keys to mastering husking is making a teeny loop at the end of your strip of paper. This loop is what’s going to ensure your paper stays on the first pin. Be sure to use a small dot of glue to make sure the loop stays put. Start with the loop around a pin at the bottom of your template. This bottom pin, pin #1, will always be the ending point for every loop you make. TIP: It seems to be a bit easier if you only add the rest of the pins as you need them, instead of all in the beginning. From #1, bring the strip up around #2, and back down to #1. Bring your strip under #1 and to the left, adding pin #3 and looping around it. From #3, bring the strip back down under #1 and to the right to add and loop around #4. After #4, bring the strip back under #1 and continue adding pins in the same manner, alternating sides until you get to the outside edges of your flower petal. It shouldn’t be necessary to add glue when you get back to #1 every time, but you absolutely can if it makes you feel more secure. As long as you handle your flower petals gently, they should stay together once the pins are removed. Once you’ve made all your loops and gotten to the outside edges, you might need to add some pins along the sides to keep the shape you’re looking for. After all the loops have been made, you should add a small dot of glue at the bottom if you haven’t been gluing all along. To finish the husking technique, bring the rest of your quilling paper strip back towards the top of the petal. Add some glue to the tops of all the loops, and mold the strip to each one, pinning into shape if you need to. End the strip back at the bottom. I like to wrap the outside of the petals twice to make sure they are nice and sturdy. Repeat the process to make 4 to 6 petals for a flower. Try to change up the shape a bit for some of them, just to make your flower look more natural. I also added some small loops of deep rose paper inside my petals. They didn’t show up too well against the red. I’d probably use more of an orange or yellow next time. Once all your petals are made, you can start putting your flowers together! I was looking to make more of a 3-dimensional poppy flower, so I decided I needed to use something to make my petals stand up a bit as they were drying. It turns out, a roll of washi tape works perfectly! I lined 3 petals up so the bottoms were touching and right at the center of the tape roll. Next, I rolled 2 17″ strips of pale yellow into a tight coil with a slight dome and added some glue to the underside. Then, I placed the yellow dome in the center of the petals and pushed down gently so the petals popped up a bit. The toughest part was trying to keep still while the glue set. I recommend using Tacky Glue for this step, so you don’t have to wait too long. It might also help to prop up your petals with a pen or some other tool as the center dries. Once the glue does dry, the petals will be standing at a nice angle, so the poppy looks like it’s in the middle of its bloom. Flip your flower over and glue the other 3 petals to the bottom, positioning them to be between the first set. These flower petals might look delicate, but they stand up nicely on a wire stem. To make sure they stay, I rolled a tight coil from a similar green as the floral wire, like this leaf green, and pushed it to a dome. The dome fits perfectly on top of the wire, and the finished flower fits right on that! I also practiced the husking technique to make some flowers out of crimson and deep red paper strips. I think these are my favorite! The darker colors are so striking! These flowers can also easily be turned into poppy pins to wear for Veteran’s Day, as the poppy flower is a traditional symbol of remembrance for the sacrifice of soldiers. I hope this post inspired you to try the husking technique and increase your quilling bag of tricks. And it’s good for more than just making flowers! Think about using husking to make leaves, butterfly wings, or snowflakes. You can always draw your own templates, or use one of the husking boards that are available online. Custom Quilling by Denise offers a Husking Board Free Form, that is sold with pins to create your desired shape without a drawn pattern. Her site also sells this husking kit, for those who need a bit more guidance. Plus it comes with paper. Bonus! Amazon sells a few versions of husking boards, as well. The one below has gotten great reviews! Don’t let this loooong post turn you away from trying the husking technique! 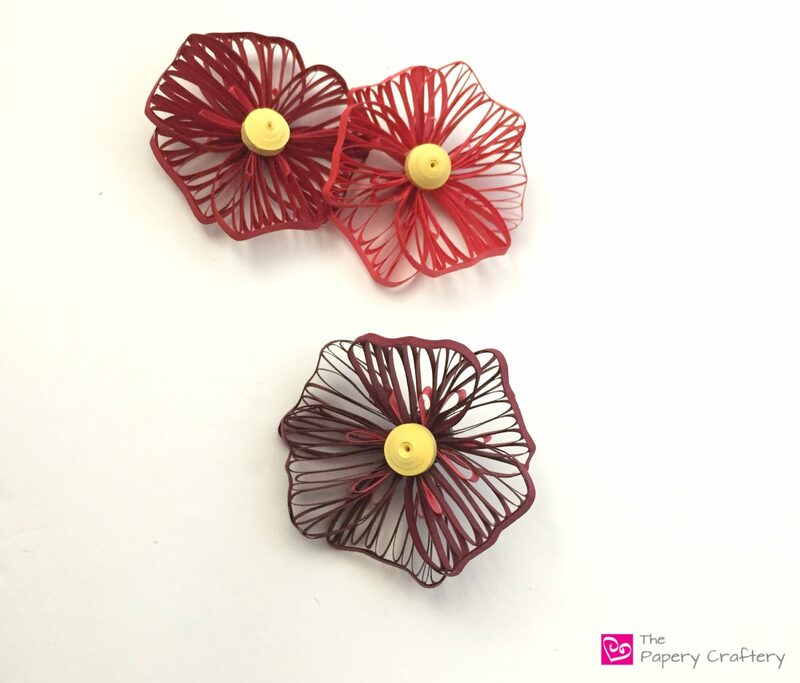 Husking can add a beautiful change of texture to your quilling designs by adding light and fluttery elements that contrast nicely with bolder details. It might take a bit of practice, but the results are worth it. I’m glad you’ve found my page, Santosh! Thank you for your kind words!